Two years ago I targeted Nebraska and South Dakota for that year’s Fall Tiger Beetle Trip. I had gotten my first experience with what Nebraska had to offer with a long weekend trip to the Nebraska Sand Hills during the previous fall, and with my appetite fully whetted as a result of that trip, I made a full-blown week-long trip through not only the Sand Hills, but further west to the Pine Ridge area in northwestern Nebraska and the Black Hills of South Dakota. It was a phenomenal trip that featured not only tiger beetles (13 species in all), but rare longhorned beetles, aggressive rattlesnakes, and a stunning array of autumn-flavored Great Plains landscapes. 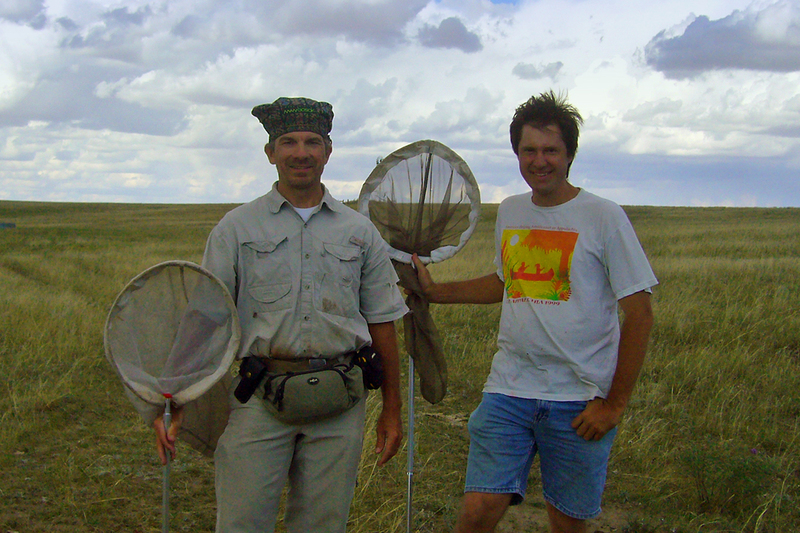 Ted MacRae and Matt Brust stand in Cicindela nebraskana habitat (northwestern Nebraska). Probably the species that I was happiest to encounter on that trip were Cicindela nebraskana (prairie long-lipped tiger beetle), C. lengi (blowout tiger beetle), and C. limbata (sandy tiger beetle). I can’t claim sole credit for those finds, since I had made arrangements to meet Nebraska tiger beetle expert Matt Brust and have him show me some of his favorite sites. With Matt’s help, both in taking me to localities and directing me to others, I found nearly every species that I was hoping to see. Nearly, but not every species that is. The one species I really hoped to see but knew was a long shot was Cicindela decemnotata (Badlands tiger beetle). It’s right at the easternmost limit of its distribution in northwestern Nebraska, and only a handful of individuals have been seen in the state. Another species I did not see was Cicindela pulchra (beautiful tiger beetle). You’ve heard me talk about this species on several occasions, referring to my experience with it in south-central Kansas (written up in this little note) and my later obsession – so far unfulfilled – with finding it in nearby northwestern Oklahoma. I didn’t even try to look for this species… because nobody knew it was there! It was not until the following year that Matt found it in the Badlands of South Dakota, and since then he has located a number of populations in that area. It is with C. decemnotata and C. pulchra in mind that I make return trip to the South Dakota Badlands for the Annual Fall Tiger Beetle Trip™. This time I am accompanied by fellow cicindelophile and field companion Chris Brown, and by the time you read this we will be on our way to meet up with Matt once again and focus our efforts on finding these two species. In this far northern area, it is already late in the season, so success is not assured. However, with Matt showing or directing us to some of the localities where he’s found these species, we’ve got the biggest bullets in our guns possible. Since I’ve already seen many of the other interesting tiger beetle species up that way (C. nebraskana, C. lengi, C. limbata, etc.) from the previous trip, we will be free to devote all of our attention to finding these two species – including driving even further west into the heart of Wyoming, where C. decemnotata occurs a little more reliably. If I come back from this trip with nothing more than some great photos of one of these species, the trip will have been a success. If I come back with photos of both of them, the trip will have been a huge success. Along the way, I’ll still keep an eye out for other tiger beetles – especially C. nebraskana, C. lengi, and C. limbata, because about the only thing I would wish for on top of success as photographing C. decemnotata and C. pulchra is nicer photographs of these other species as well to replace the dreadful point-and-shoot versions that I have from my 2008 trip. This entry was posted in [No taxon] and tagged collecting trip, entomologists, entomology, Great Plains, insects, nature, science, tiger beetles. Bookmark the permalink. Virginia is a lot closer than Wyoming. You’ll have to come out here some time and check out our TBs! I’d love to – you’ve got Cicindela ancocisconensis in the west (probably the closest population for me to get to) and Habroscelimorpha dorsalis in the east – two species I’ve not yet seen in the wild. If I can find a time slot, you’ll be the first to know! You are always welcome. I know good spots for both of those species! Best of luck on your trip it sounds exciting. I’m sure that I am not the only one looking forward to reading about and seeing your discoveries! I was hoping this post would whet some appetites. Now all I have to do is actually succeed. Exciting trip Ted. Best of luck. Come to Malaysia some day! Malaysia would be the awsomest. Asia and Australia are the two continents I still haven’t explored (well, and Antarctica, but there aren’t any bugs there. Well, yes there are, but no tiger beetles :)). Please say hello to Matt. Good weather, safe travels, and tiger beetle filled days. Thanks, Kent – wish you could’ve come along! We’ll get out together someday. Way to go Ted. Looks like you almost clipped the Pawnee National Grasslands, one of my old stomping grounds. If you kept going another 18-20 h from G, you could be in Edmonton. Couldn’t promise you any tiger beetles, though. After two hard frosts there aren’t even any bumblebees and besides, most of the neat tiger beetles are in southern Alberta. But I could introduce you to John Acorn who can tell tiger beetle stories all night. Well, the trip I was really trying to put together for this fall was to loop through Colorado, Utah, and Idaho and look for the sand dune species – Cicindela albissima, C. waynei, C. theatina, etc. Had to keep this trip down to ~5 days though so maybe next year. I’d sit and listen to John Acorn tell tiger beetle stories all night!